We have a block of rooms at the very close by Comfort Inn. The rooms are $129, and the hotel is less than 10 minutes from our house. 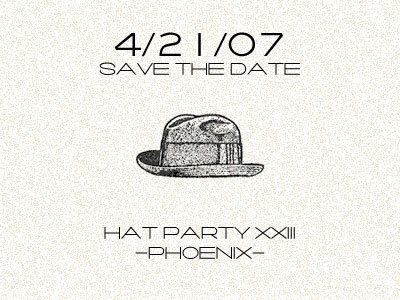 The rooms are held under Fleischer Hat Party and you should call 480-596-6559 if you want to make a reservation. Not splendiferous, but serviceable. The block will be held until March 20 and then will be released. Another option, although we didn't block out rooms, I found on Hotels.com. It's the Sunterra Scottsdale Villa Mira. They advertise studios with a bed and pull-out for $119 and little condos with a separate bedroom and a pull-out for $166. They have more amenities -- it's really more of a resort, but they are a bit further from us -- close to the TPC golf links -- about 20 minutes away. They are not really fancy, but would certainly be fine for the weekend. And of course there are absolutely gorgeous hotels with great spas here if you're looking for a real getaway -- Camelback Inn, Royal Palms, Sanctuary, to name a few. The really cheap hotels on Hotels.com are all not near us at all and you really don't want to stay there. Our address is 6102 E. Yucca St. Scottsdale, AZ 85254. You may want to use google maps to see how far your hotel is from our house before you book it.